Description: The Owl Holder is unique in the fact that the head is rounded rather than the more typical V-shape. The wings are folded inward, and there is a soft fringe around the eyes, tail, and wings. 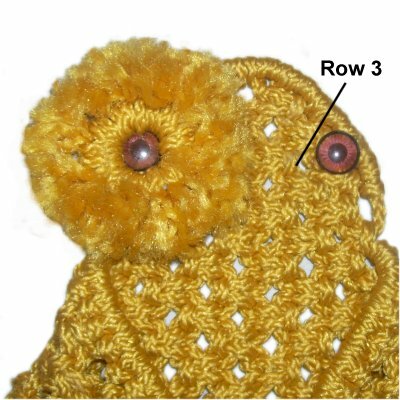 A ring or square is added to make this Macrame Owl a towel holder. You can add a branch if you don't want a ring. Try to use plastic eyes rather than beads. 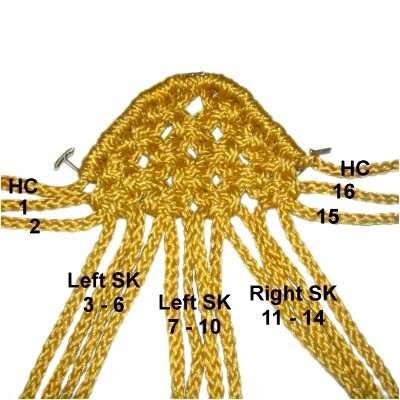 This Macrame project is rated Easy, suitable for beginners. 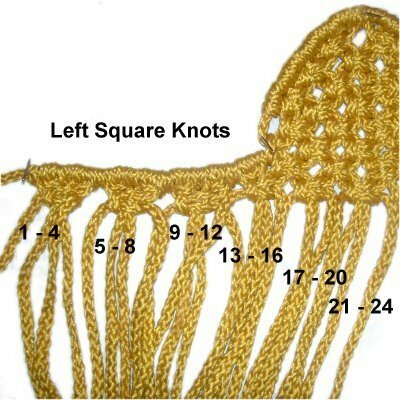 Make sure you know how to tie all the knots listed below. The finished size is 18 inches tall (includes hanger). Cut 8 cords, each 2.5 yards long. 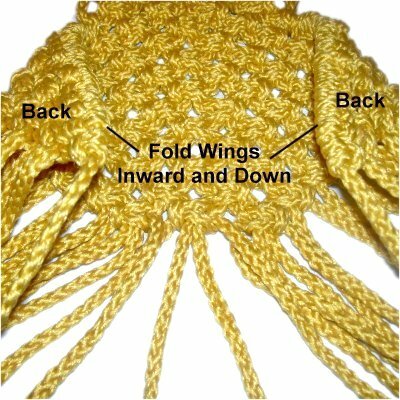 Prepare the tips to prevent unraveling while you work on the Owl Holder. When using Bonnie Braid, you can melt the tips with a flame. Step 1: Arrange the holding cord horizontally on your board. Secure it at the center and close to the ends, making sure it has tension. 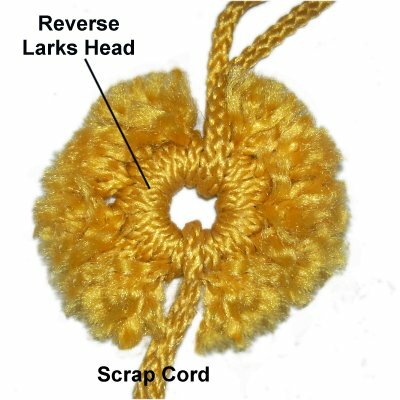 Attach the first 2.5-yard cord to the holding cord with a REVERSE Larks Head knot, as described below. It should be placed to the left of the center. 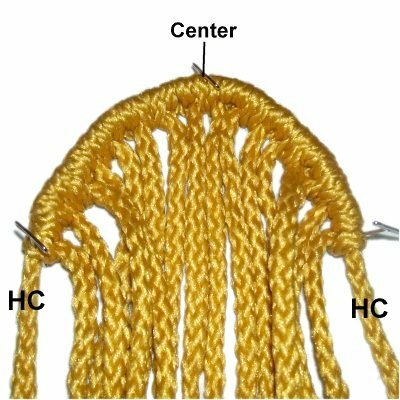 Match the ends and tighten. 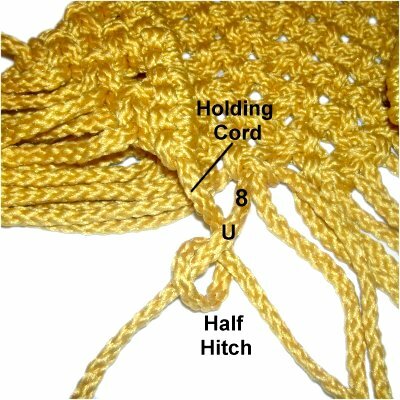 Tighten the Larks Head firmly, then tie a Half Hitch with each half of the cord. Tighten those knots, then slide the cord to the pin at the center. Attach the other cords in the same manner, so that there are four cords on each side of the center. Now you will create the rounded Head for the Owl Holder. Step 2: Curve the cords as shown in this image, so that the ends of the holding cord are vertical. Mentally number the long cords 1 - 16 (do not include the holding cords). 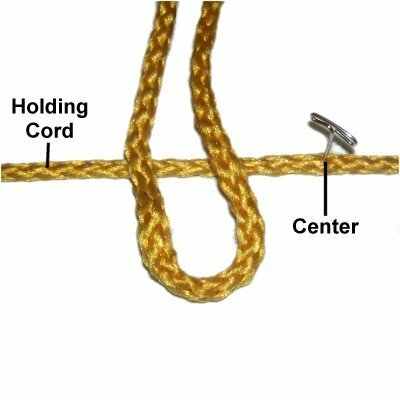 Important: All the Square Knots described below should be firmly tied, so they are close together. This includes the ones near the mounting knots, which may rest on an angle. Step 3: For row 1, tie a LEFT SK with cords 5 - 8. Whenever you make the SK on the left half of the Owl Holder, you start by curving the left working cord. In this case, that's cord 5. 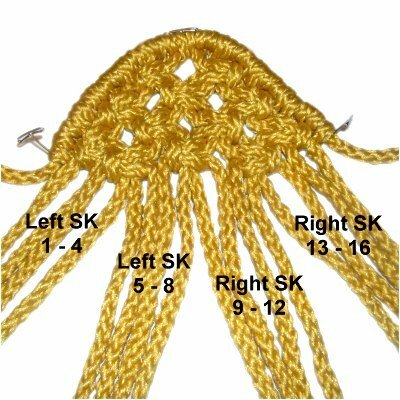 When you make the SK on the right half of the design, you always start by moving the right working cord. In this case, that's cord 12. Step 4: For row 2, tie LEFT SK with cords 3 - 6 as well as 7 - 10. 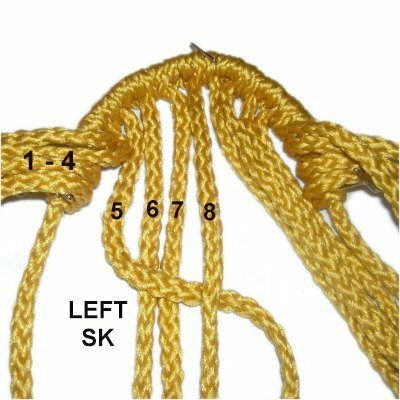 Tie a RIGHT SK with cords 11 - 14. Step 5: For row 3, tie LEFT SK with cords 1 - 4 as well as 5 - 8. 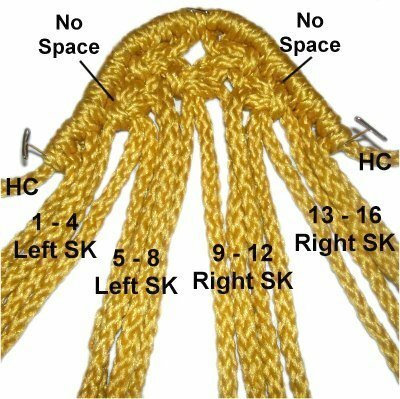 Tie RIGHT SK with cords 9 - 12 and 13 - 16. 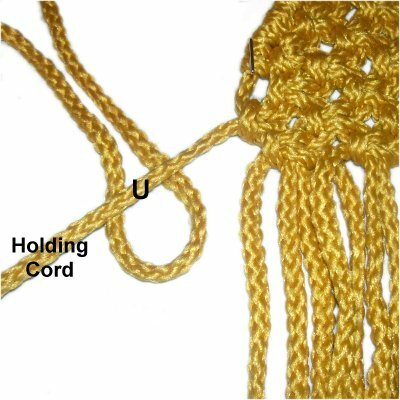 Step 6: For row 4, tie a LEFT SK with the holding cord combined with cords 1 and 2 (filler is cord 1). Tie the LEFT SK with 3 - 6 and with 7 - 10. 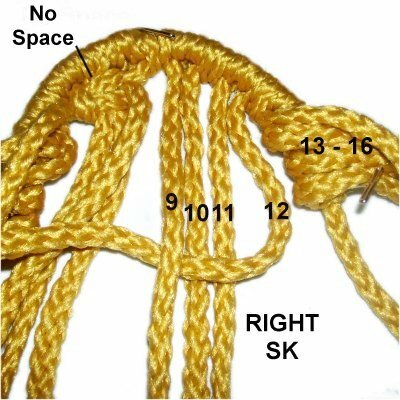 Tie a RIGHT SK with cords 11 - 14. 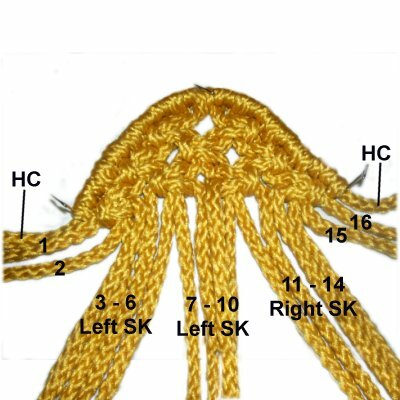 Tie a RIGHT SK with cords 15 and 16 combined with the holding cord (filler is cord 16). Step 7: To make row 5, repeat step 5. Step 8: To make row 6, repeat step 6. 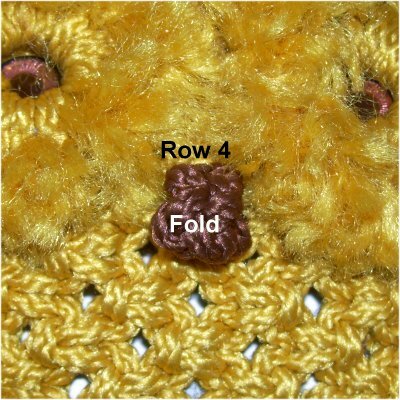 To make row 7, repeat step 5 (not shown). 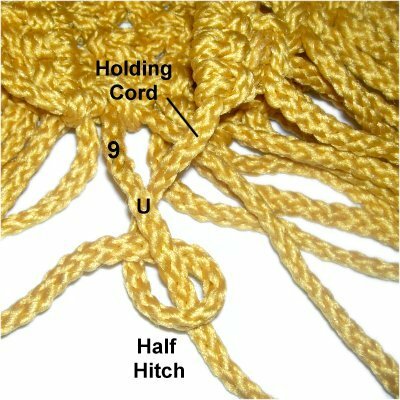 You will now add the 1-yard cords to the holding cord on both sides of the Owl Holder. These will be used for the wings. 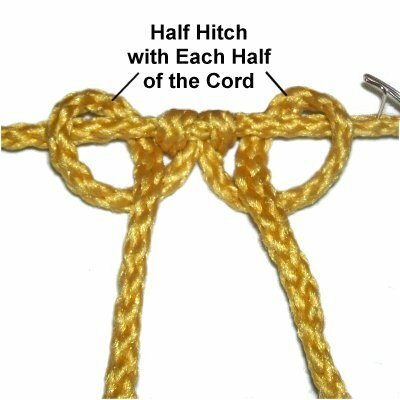 They need to be attached with a regular Larks Head knot, followed by Half Hitches, as described below. Step 9: First, move the holding cords diagonally, and secure them with tension. 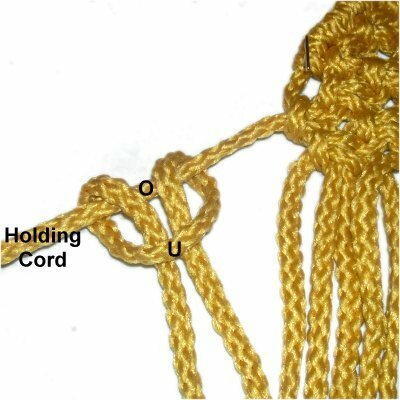 Tie a Half Hitch with each end of the cord, then slide the knots right, so they rest against the head. Step 10: Repeat step 9, placing 6 more cords beside the one just mounted. Then mount 7 cords to the other end of the holding cord, on the right side of the Owl Holder. Step 11: Mentally number all the cords (wings and head). Do not include the holding cord. Cords 1- 4, 5 - 8, 9 - 12, 13 - 16, 17 - 20, 21 - 24. LEFT SK: Cords 3 - 6, 7 - 10, 11 - 14, 15 - 18, 19 - 22. RIGHT SK: Cords 23 - 26, 27 - 30, 31 - 34, 35 - 38, 39 - 42. LEFT SK: Cords 5 - 8, 9 - 12, 13 - 16, 17 - 20, 21 - 24. 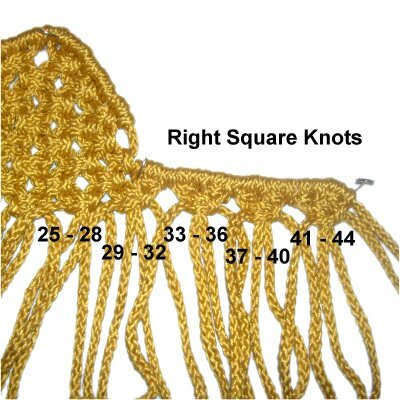 RIGHT SK: Cords 25 - 28, 29 - 32, 33 - 36, 37 - 40. LEFT SK: Cords 9 - 12, 13 - 16, 17 - 20, 21 - 24. RIGHT SK: Cords 25 - 28, 29 - 32, 33 - 36. LEFT SK: Cords 11 - 14, 15 - 18, 19 - 22. LEFT SK: Cords 13 - 16, 17 - 20, 21 - 24. RIGHT SK: Cords 25 - 28, 29 - 32. LEFT SK: 15 - 18, 19 - 22. RIGHT SK: Cords 23 - 26, 27 - 30. 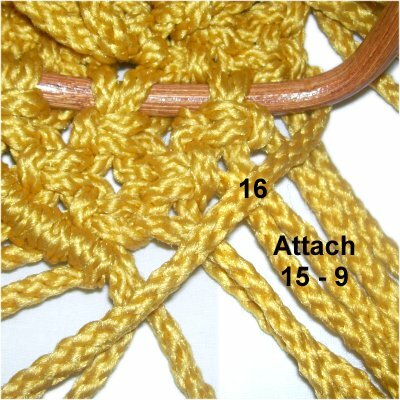 Step 20: Rows 16 and 17 are tied with the body cords only, so mentally number them 1 - 16. Make sure you don't include any wing cords, which are shorter. Row 16: LEFT SK with cords 3 - 6, and 7 - 10. RIGHT SK with cords 11 - 14. Step 21: Fold the wings inward and down, so the back of them is face up. They should be triangular. Bring them to the center of the body, where they will be attached. 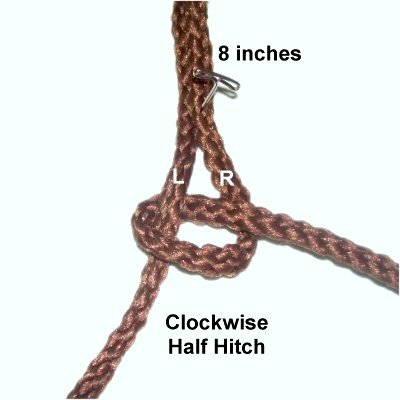 A single Half Hitch is shown in this image, and the one below. 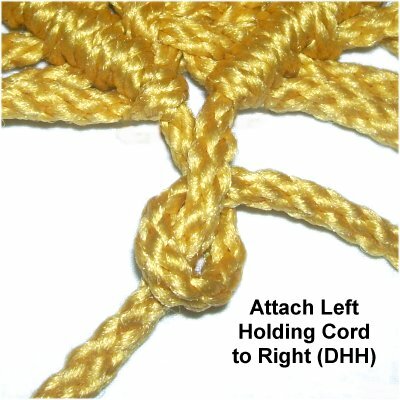 Slide the holding cord for the right wing under cord 9, then attach it with a counter-clockwise DHH. Step 22: Tie row 17, which completes the body of the Owl Holder. LEFT SK with cords 1 - 4 and 5 - 8. RIGHT SK with cords 9 - 12 and 13 - 16. Step 23: Place filler cords 4 and 5 over the large ring. Working cords 3 and 6 should be under it. Use the 4 cords to tie a LEFT SK, below the ring. LEFT SK with cords 7 - 10 (8 and 9 over ring, 7 and 10 under ring). 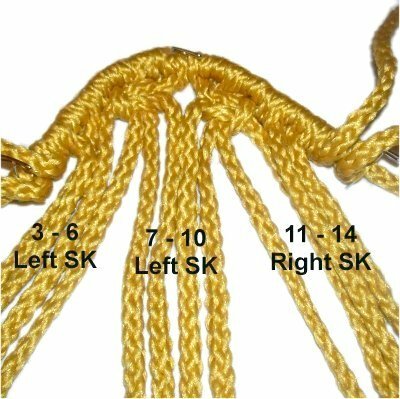 RIGHT SK with cords 11 - 14 (12 and 13 over ring, 11 and 14 under ring). LEFT SK with cords 5 - 8. RIGHT SK with cords 9 - 12. Step 27: Move cord 1 along the left diagonal edge of the ASK. Secure it with tension. Attach cords 2 - 8 to it with counter-clockwise DHH. Step 28: Move cord 16 down the right edge of the ASK. Attach cords 15 - 9 to it with clockwise DHH, in that order. 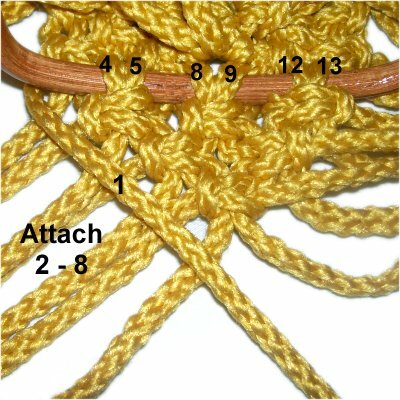 Step 29: Attach the holding cord on the left to the one on the right with a clockwise DHH. Step 30: Trim the cords so they are 6 - 12 inches long. Unravel and brush if you want fluffy tail feathers for your Owl Holder. You also have the option of adding beads and/or other knots. Step 31: Cut 10 pieces of material, each 5 inches long (or use scrap cord). Mount each to a 1.5-inch ring with a Reverse Larks Head knot. 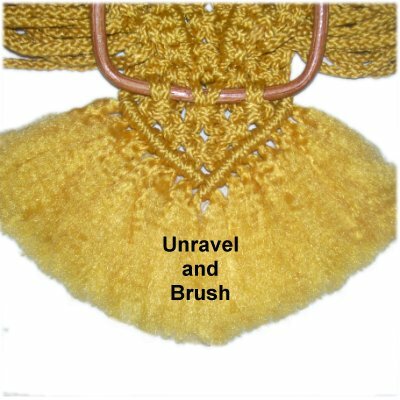 Unravel and brush the fibers. Trim the feathers to around 1 inch long. Place 2 pieces of scrap cord around the ring between the other cords. These are used to attach the ring to the face of the Owl Holder. Apply glue or secure in the most appropriate manner (such as washers). Step 32: Place the eye feathers over the left eye. Secure them by passing one end of a scrap cord through an opening in the face, front to back. The best place is above the eye near the mounting knots. Place the other end of the same cord through a different opening nearby. 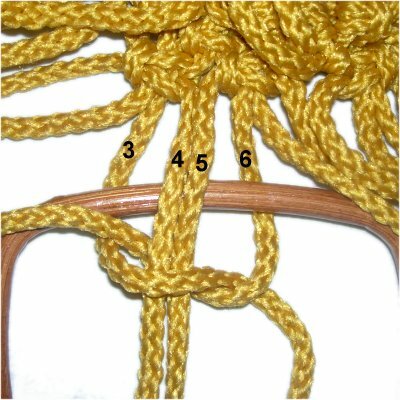 Step 32, continued: In the back of the Owl Holder, tie the two ends together with an Overhand knot. Apply glue while tightening, and cut off the excess material when it's dry. When using Bonnie Braid, you can heat the tips to melt the material. Step 33: Repeat step 32 with the second scrap cord (same ring), placing it through two spaces lower down on the left side of the face. Step 34: Repeat steps 31 - 33 to make and attach the second ring of eye feathers on the right side of the face. Step 35: Unless you can find a bead shaped like a beak, you will need to make one for your Owl Holder. Cut two pieces of dark material, each 25 inches long. Move down 8 inches and secure the cords. 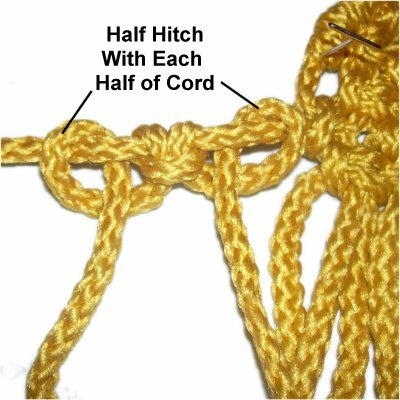 Use the right cord to tie a clockwise Half Hitch onto the left. 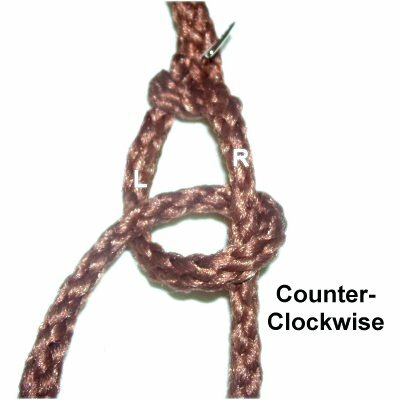 Tie a counter-clockwise Half Hitch with the left cord, onto the right. Alternate between the right and left cords, tying a total of 8 - 10 knots. Step 36: Place 2 ends of the beak through a space just below Row 4 (in the center). Place the other two through a different space. 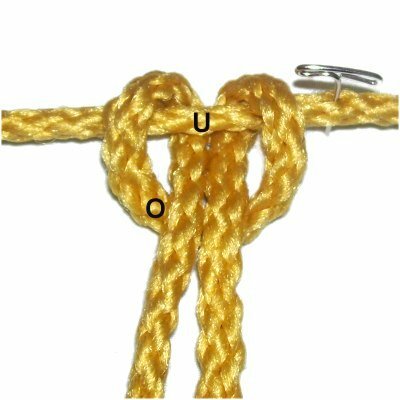 Tie two ends together with an Overhand knot. Apply glue. Do the same with the other two ends. Cut off the excess material when the glue is dry. Step 37: Unravel and brush the wing cords, and trim them to 1.5 - 2 inches in length. There's an opening at the top of the head in the center of the Owl Holder. Place a piece of scrap cord through it, then tie the ends together to form a hanger. Have any comments about the Owl Holder? Contact Me.